I hate wasting time; I hate wasting energy. There's too much to accomplish! But this morning I trailed off from redesigning my portfolio on a path I don't hear a ton of graphic designers talking about, regrettably consuming my energy and time into a black hole. 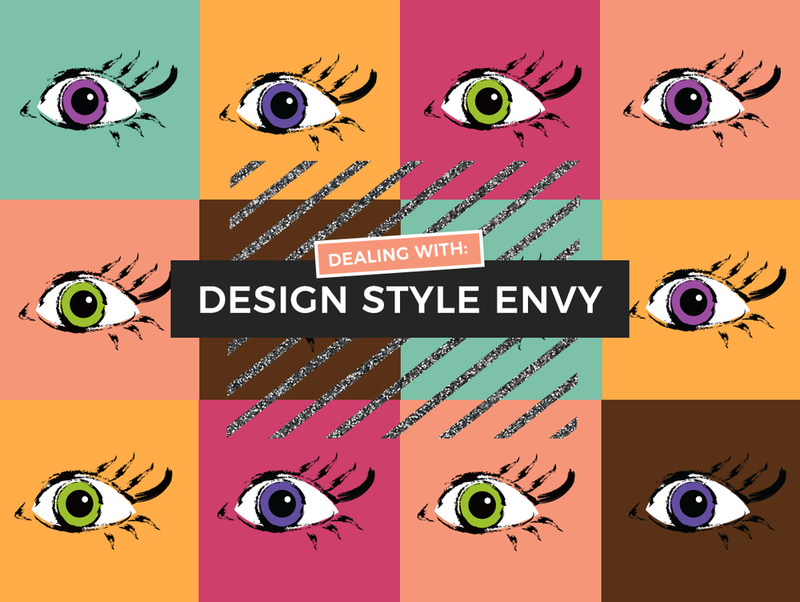 I'm talking about: design style envy. Not lusting over different styles, but the fact designers even have one at all. After my daily espresso, I searched for inspiration from designers and studios I look up to (Darn Good, Pollen Studios, for example) and realized many of them had something in common- their projects used similar colors, themes, design eras, and textures; they had a style. And I became incredibly envious! It seems like they know themselves, like there's confidence in where they belong in life. In University we were taught good design meant there were no biases from the designer, a scientific leaning approach. The instructors believed any semblance of personality was 'bad' design. They taught the design process is about the client and listening to every one of their needs before coming up with the (closest to) objective solution specific to them. It would be near impossible if these specific custom solutions happened to have similar color pallets and fonts coming from the same person. Design isn't about ego, it's about solutions. Personality didn't have a place in these solutions. HOWEVER— now after marveling at these beautiful self-branded portfolios, this principle learned from University is challenged and part of me wants to throw away this mindset all together. These studios consistently create absolutely incredible design and visuals and I wonder if the restraints they set for their branding is actually what lets them create such high quality content. Any designer knows, rules are your best friend! Design principles are always there, is it really horrible to have a general color pallet, pattern and font usage that is consistent amongst projects? So I want to work through positives, negatives and reasons for having a style as a designer and figure out if this is something all designers should strive for, or if it serves a purpose bigger than what I understand currently. Lets explore! When would a style be beneficial? It can make sense on the client end, there's less risk. You visit the portfolio of one of these designers and you essentially know what to expect. You can anticipate the general aesthetics & quality and decide if the personality of your brand aligns with theirs. It also can make sense from the designer's end. How much simpler of a career would it be to have a brand standard .ai file for yourself!? Or at least a generally similar lettering voice? You might put in extra work up front polishing your colors, type, and creating custom patterns lets say. But after that the eyedropper with a little fine tuning would be your best friend. This would be be much more efficient on the designer's end. And you would still deliver exactly what the client is hoping for, at an expedited rate. Both the client and designer would benefit from this rough assumption of expectations. It saves time by cutting out the initial sketching and presenting of completely different brand concepts. When would a style hurt you? Of course it would turn away many people if their needs weren't represented on your portfolio. If versatility isn't showcased, you better hope your specific style is in demand. (But, being selective in jobs could be seen as a milestone of success to some). Thing is, design principles are forever, but the demand for specific aesthetics might be as fickle as fast fashion. Even if your abilities are broad and you are a multifaceted person, if you present yourself as one personality many individuals and businesses that need help with their own vision, not yours will look elsewhere. They need to be listened to, not told. How might long term life goals relate to a style? It's important to consider your long term goals for your (design?) career, because accommodating potential clients might not even be important to you. Self-awareness is key in your career and lifestyle. Do you hope to sustain variety in your work and continue to help entrepreneurs (and/or businesses through working at design firms) reach success, without much credit needed? Then maybe you have a passion for the objective design process and should keep a plethora of variety in your work so you can stay open to any opportunities that come your way. If you want to work at a design firm or marketing company, versatility is important. Here the client's unique needs are the focus and there's extensive research plotting that most objective solution to design, as I was taught at University. It definitely has a need and purpose and you are able to create designs completely custom and one-of-a-kind. As long as you are listening to their goals, you will help design meaningful solutions for their brands that impact many. Do you hope to eventually utilize your years of experience and quality design examples to own your self-created educational content? Maybe start speaking about design and leading others? Then finding the sweet spot of both branding yourself but also showing your versatility should be your pursuit. And I think this is where the designers I was looking at this morning fall into, so it makes sense now. To be a leader you need both a personal brand that expresses who you truly are and content to prove you practice the design principles you preach. It's possible to get in trouble with a fickle identity that needs to change every few years to stay with the times, but I do believe if you stay true to who you really are at the core, and you use versatile enough elements you can do this successfully. If you are showing your true colors (literally) then your brand will have resonance and stability for years to come. Do you hope to step away from client work all together and dive into the entrepreneurship sector, developing your own companies and entities as a source of income? Then it would make sense to spend efforts on your brand and voice, in order to build credibility as part of a wholistic representation of your values and work. But in this case the value of your portfolio to your lifestyle would be more of a conversation piece and less of what defines your future work. It would be where you have connecting URLS to your own projects that live in their own space. Maybe if you have income from other business pursuits you've created yourself, your portfolio could be more of a fun place to show your art and you can take more risks. Do you want to step away from the design process and focus more on how to utilize your illustration skills and self-expression in conjunction with the design world? Then absolutely try to narrow in on your primary illustration skills and voice you want to be sought out for. It might take some time to figure out what sort of creative expressions can be consistent enough and work best in conjunction with brands, but if you go this route companies would seek you out for your unique personality, which would feel rewarding I imagine. Of course in this scenario you would still be in the business world, not at the end of the artistic self expression spectrum, optimizing your skills and creativity for compensation from brands rather than being an artist tucked away in a studio expressing your political passions. Having large influential brands hire you for your skills could feel validating, though indeed you can choose to focus on editorial content, or focus solely on small businesses, for your illustrative expressions if you don't like the idea of appeasing to large consumer brands! There's never going to be a blanket 'right' way to be for your specific path, and worrying about or comparing your portfolio to others with different long term goals than you is a waste of time and energy. It's not so bad to have a style in how you present your work, and can be very beneficial to you, as long as it aligns with the short and long term goals you have set for yourself, which is not going to be consistent with everyone no matter how pretty or self-aware that other portfolio looks. There's nothing wrong to have those feelings of inadequacy or lust when seeing other portfolios, just like it isn't wrong to have those feelings about a beautiful person. It's perfectly natural and timeless to feel envy, what matters is how we act with these feelings. We can face our feelings head on to analyze what this means for our next steps. It's not feeling happy or stable that motivates us to create, contrarily often it is those feelings of inadequacy that really drives us to move forward. (I recently read a great article where Jessica Walsh admits to something similar.) In an uncomfortable way, we have to embrace these feelings. It all boils down to looking inward. What do you find important? What are your short term goals? What are your long term goals to work toward? The primary lesson I've learned is how extremely important it is to understand the difference in presenting yourself as an illustrator/artist vs. designer. Some of the 'designers' I was going to share earlier I realized were actually primarily illustrators, so of course they will have a more consistent personality in their content. When you identify towards an artist, there's space for your personality and expression. When you identify on the other end of the spectrum as an unbiased designer, you will take a more scientific objective approach to your work. Awareness of this spectrum is essential. Maybe it's a good time to consider if you want to be considered more of an illustrator/artist rather than designer. It boils down to who you are at the core and where you belong. For therapeutic motivations I'll try to reach a personal conclusion to avoid wandering into this time and energy black hole again. To be honest, I have a general idea of my long term goals but I'm still trying to figure that out. For now, I mostly love the freelance lifestyle having variety and getting a rush working directly with entrepreneurs making their ideas come to life and legitimacy with a solid brand. But I connect with them because I also have the entrepreneurial spirit myself, and would love to create products that help people. I'd also like to design a way to earn and direct capital past my myopic point of views and towards important global issues, like climate change, social justice, and peace. The philosophical connection in design thinking is what keeps me engaged. I can see logically why showing versatility is important, but might not be able to get over the existential arguments for it. After all, if we aren't introducing our unique view points and expressions into the world, what exists from us? Are we merely just deduced down to a tool to get from point A to B? Having at least some loose style is what helps the design world move forward in a way. Writing this all out really helped me. I'm obviously not a teacher or leader, I just hope to work through my issues publicly to maybe relate to others so we can figure this design thing out together! If you have any comments or thoughts on the topic I'd love to hear from you! Have you had similar issues with your identity? Do you feel there's another way to see it? I'm all ears.